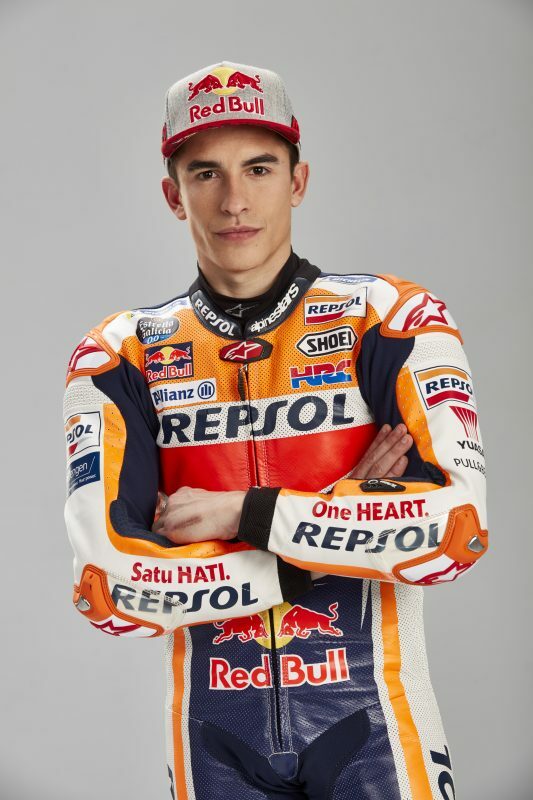 Marquez is a six-time World Champion (1 each in the 125cc and Moto2 classes, plus 4 in MotoGP), and was the youngest rider ever to be crowned king of the premier class. During the 2014 season, he totaled 13 victories - the most premier-class wins in a single season, bettering the mark set by fellow Repsol Honda rider Mick Doohan in 1997. 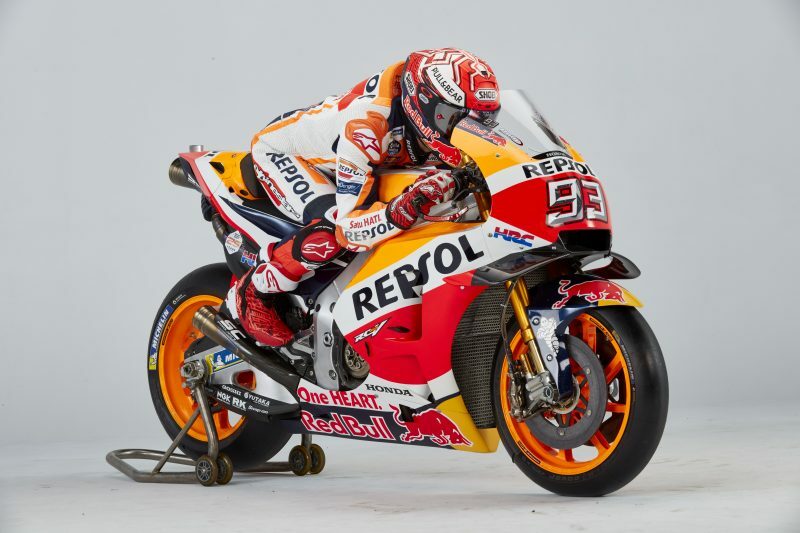 The 2015 season was Marquez’s most challenging year in MotoGP as he finished third, but he still managed five victories, nine podium finishes and eight pole positions. 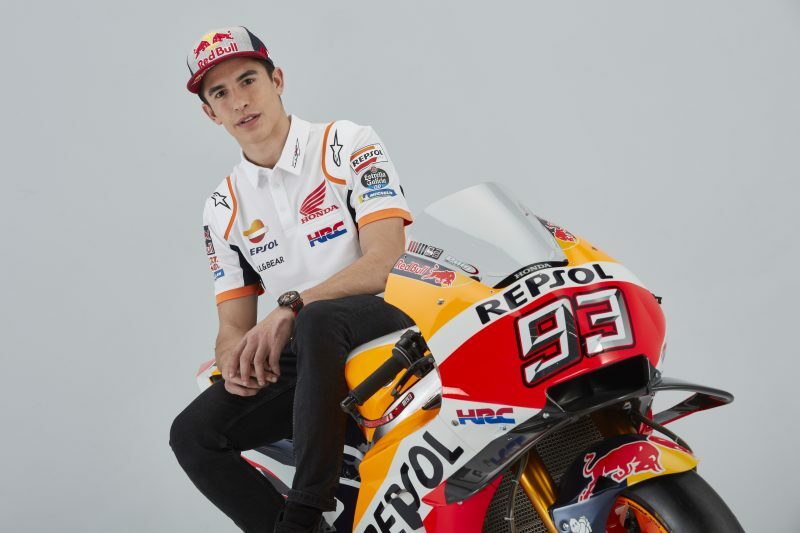 The 2016 MotoGP World Championship crowned Marc as the youngest rider to win 3 premier-class World Championships, bringing his tally to 5 titles over all classes in a GP career just 9 seasons long. In 2017 Marquez won his fourth MotoGP world championship in five years after his only rival Andrea Dovizioso crashed out of the season-ending race in Valencia. At 24 years and 268 days old, Marquez took the record from Mike Hailwood, who was 25 years and 107 days old when he won his fourth premier-class title in 1965. 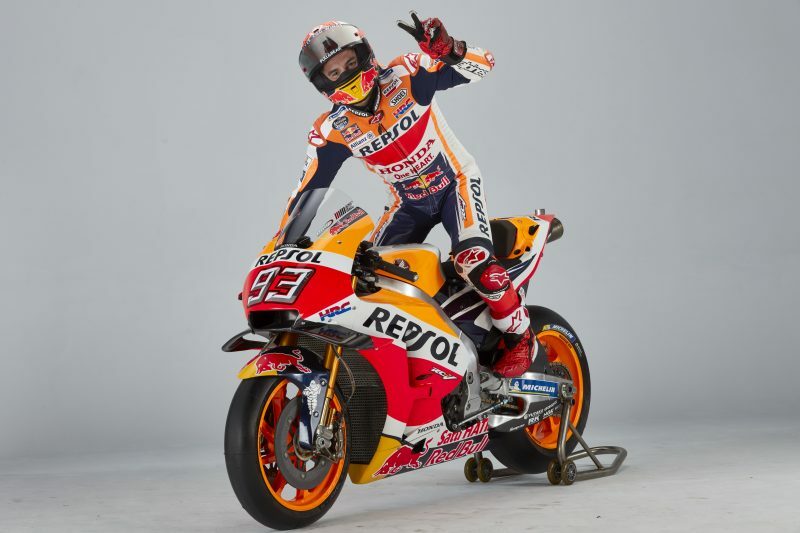 Marc was also the first rider in the 69-year history of grand prix motorcycling to win at least five races a season for eight years in a row. On 17 February 1993, a future champion was born in Lleida, Spain. Marc has always lived in Cervera, a small town near the capital of the province where he resides with his parents and brother Alex. In 1999, his father bought him a second-hand 50cc off-road pocket bike, on which he continued to enjoy enduro and also began in motocross. In 2000, although he continued competing in enduro, he was also runner-up in the Catalan Motocross Championship, and in 2001, he took another step forward and won the Catalan Championship of the Initiation motocross category. In 2002 Marc finished third in the Conti Cup, a road racing series promoted by the Catalan Motorcycling Federation. He continued competing in motocross but began shifting his focus to road racing. Marc changed to the big circuits in 2003 by taking part in the Open RACC 50, a six-race Catalan Championship, and he won the title with an overwhelming performance in his first year. The 2005 season was an important one for Marc, as it was then that he met Emilio Alzamora, 1999 125cc World Champion with Honda. During that season, Marc won the 125cc Catalan Championship, as well as the 85cc Catalan Supermotard Championship. The following year, 2006, he repeated the Catalan triumph, and at the same time made his debut in the Spanish Road Racing Championship (CEV), where he achieved an eighth overall position. Marc’s debut in the Motorcycle Road Racing World Championship was with the Repsol KTM Team at the 2008 Portuguese Grand Prix in Estoril because an ill-timed pre-season crash resulted in a fracture of his right arm, preventing him from being on the starting grids for the first two races. In his sixth race, the British Grand Prix, he was able to set a milestone in motorcycling history taking third position, becoming the youngest rider ever to make it onto a World Championship podium. He finished his rookie season in 13th position overall, despite having missed four races due to injury. The 2016 season positively proved that Marc is a fast learner. He approached his fourth MotoGP campaign with a new mentality, vowing that he would fight for the win or the podium when possible and would minimize the damage when the odds were against him. Consistency was the key to a season for which the introduction of unified electronics and a switch from Bridgestone to Michelin tyres shook the field up and made the racing more unpredictable than ever. Back in Europe for the first race on home turf, Marc realized that trying to win was too risky and wisely settled for third behind title rivals Rossi and Lorenzo. In France he wasn’t able to avoid crashing on lap seven while fighting for second but re-joined the race in last place and finished 13th. The Italian GP was a first important turning point in the season, as Rossi retired with an engine failure. Marc engaged Lorenzo in a spectacular duel for victory on the final lap, and he lost it at the line by a mere 19 thousandths of a second. The Catalan GP two weeks later dealt a cruel blow to the riders and the whole MotoGP movement, as 24-year-old Moto2 Spanish rider Luis Salom lost his life after crashing during the second free practice. The event continued in accordance with the wishes of Salom’s family, and Marc and Dani both finished on the podium, in second and third respectively, in the race that won by Rossi, with Lorenzo retiring after being involved in a race incident. The action resumed in August, with a tight schedule of four races in five weeks that saw Marc putting into best practice his new strategy. He managed to finish fifth in the Ducati-dominated Austrian GP, took third in the Czech GP and, not perfectly comfortable with his choice of tyres in both the British and Misano GPs, scored two fourth-place finishes, the latter in a race dominated by teammate Pedrosa. At the same time, Lorenzo dropped back in third, 61 points off the top, while Rossi reduced his standings deficit to 43 points. Marc knew that more favourable tracks were about to come, and his home GP at Aragón was circled in red in his personal calendar. He didn’t miss the opportunity, taking the 64th pole of his Grand Prix career during Saturday’s qualifying, equalling Lorenzo for most career poles in history, and scoring a momentous victory on Sunday ahead Lorenzo and Rossi, bringing his career tally to 54 wins and equalling, at just 23 years of age, Australian legend Mick Doohan. Marc also moved to 52 points clear of the Italian in the standings, and 66 ahead of his countryman. 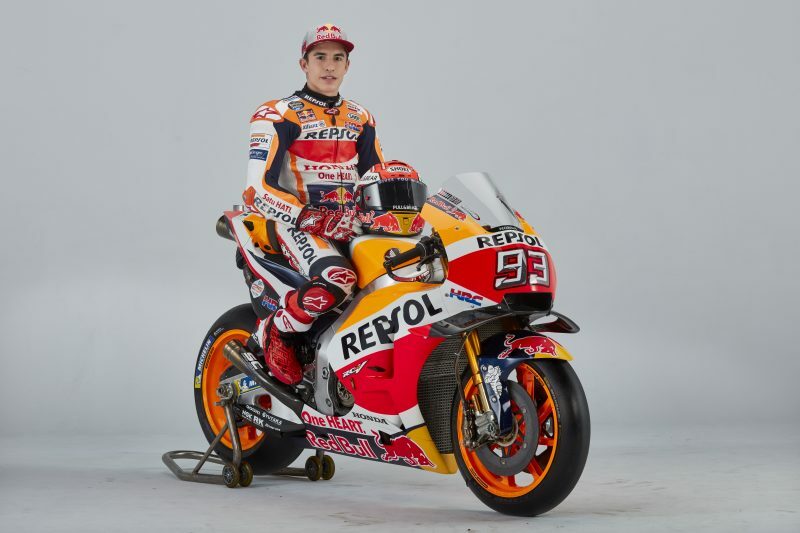 With a maximum of 100 points available across the season’s remaining four races, there was a chance that Marquez could win the Championship at Honda’s home race in Japan. A slim chance, actually. He needed to win at a track where he had never won in the premier class; he needed the Italian to finish 15th or lower and his countryman to finish off the podium. It was a long shot but Marc put in a magnificent display and won the race while both his title rivals faltered and fell. So Marc clinched his third MotoGP title and his fifth in all classes at Honda’s home Grand Prix and in front of Honda President Chief Executive Officer and Representative Director Mr. Takahiro Hachigo, who joined him on the podium, Honda Operating Officer and Director Mr. Shinji Aoyama and HRC President Mr. Yoshishige Nomura. At the age of 23 and 242 days, he became the youngest-ever rider to win three premier-class World Championship, taking the record from Mike Hailwood who was 24 years 108 days when he won his third successive 500cc title in 1964. 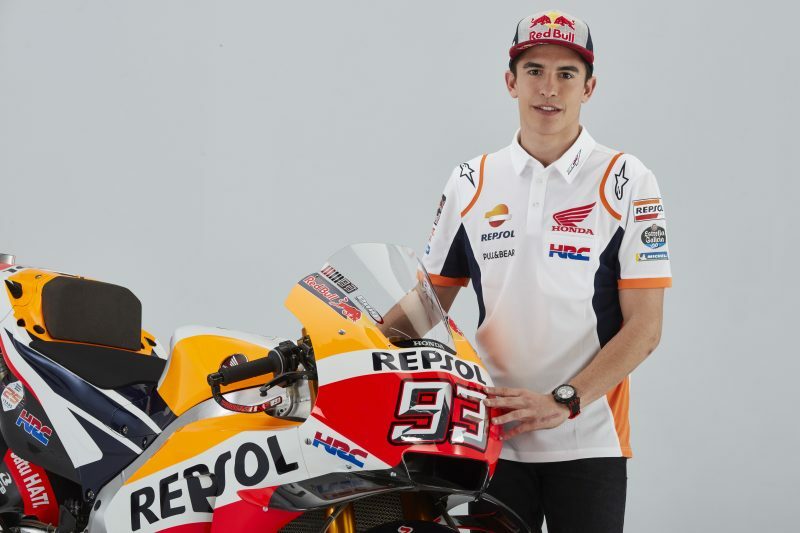 After a DNF and an eleventh place in Australia and Malaysia, Marc returned to the podium in Valencia, in the 150th GP of his career, scoring an important second-place finish and helping Honda secure its 22nd Premier Class Constructor title during its 50th Anniversary racing in the division. Marquez’s second recovery began with a podium finish in scorching-hot conditions at his second home race of the year. Five crashes in the lead up to the Catalan GP wasn’t the best weekend but Marc held it together in the race to cross the line in second, a result that lifted him to third in the Championship standings, just 23 points off the top. Marc then took a crucial third place at TT Assen which, combined with a DNF for Viñales, reduced to 11 points his gap to the top of what was proving to be an incredibly close Championship, even if he was still in fourth place behind Andrea Dovizioso, Viñales, and Rossi. Assen represented the 94th career podium for Marc and the 400th for the Repsol Honda Team. One week later, Marquez’s second win of 2017—and his eighth in a row at the Sachsenring, after starting from pole position—allowed him to head into the summer break leading the Championship for the first time of the season, with a small advantage of five points over fellow countryman Viñales. The 2018 season started with Marc Marquez and Andrea Dovizioso resuming their rivalry, the pair fighting until the last corner in Qatar. Marquez would be forced to settle for second as 2018 began in spectacular fashion. Unfortunately a weather-hit Argentina GP produced chaos in the premier class, Australian Jack Miller given a multi-row advantage as the rest of the field attempted to swap tyres before the race start. After a disappointing result in South America, Marquez bounced back and continued his perfect form at the Circuit of the Americas for the sixth straight year. As the championship returned to Europe, Marquez continued his run and won in Jerez and then in Le Mans and opened up a solid lead in the championship. A fall in Mugello and a second place finish to Jorge Lorenzo in Catalunya, cut Marquez’s advantage but back-to-back wins in Assen and at his beloved Sachsenring put the record right once again. Both tracks were hard fought victories, the competition in the MotoGP class tighter than ever. This close battle would continue after the summer break as the Ducati pair of Andrea Dovizioso and Jorge Lorenzo once again pushed Marquez hard in Austria and the Czech Republic. Having not won since the German GP, Marquez went on a run of victory in Aragon, Thailand and Japan to seal his seventh title at Honda’s home race in Motegi. Level 7 had been reached. Marquez would round the year off with a win at the Malaysian GP and a total of 321 points. During the off season, he would undergo a complex surgery to repair his left shoulder which was suffering from frequent dislocations. At the age of 20 years 266 days in 2013, Marquez is the youngest rider to win the premier-class world title. In 2014 he became the first rider to win thirteen premier-class grand prix races in a single season. During 2014 he became the first rider since Agostini in 1970 to win the opening ten premier-class GP races of the season. At the age of 24 years and 268 days, he is the youngest-ever rider to win four premier-class World Championships, taking the record from Mike Hailwood, who was 25 years and 107 days old when he won his fourth premier-class title in 1965. At the age of 24 years and 268 days in 2017 he is the youngest rider of all-time to reach the milestone of six world championship titles over all classes, taking the record from Valentino Rossi who was 25 years and 244 days old when he won his sixth title, the 2004 MotoGP crown. He is 1 of 4 riders in the 65 years history of GP racing to win world titles in 3 categories, along with: Hailwood, Read and Rossi. 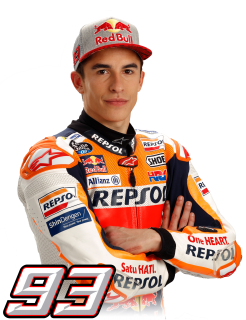 In the 2017 qualifying session at Valencia Marquez took his 45th pole in MotoGP and the 73rd in his career, setting the new record in the modern era, at just 24 years of age.